Making its debut in 1951, the Gibson J-185 is a spruce and maple jumbo body guitar, sharing materials with but smaller than the Super Jumbo J-200. The clarity and punch from the maple back and sides make it an excellent guitar for rhythm or fingerstyle, particularly in country or folk genres. 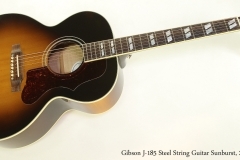 J-185 production first ran from 1951 to 1959, then from 1990 to 1995, and resumed in 1999 till today, with the current production at the Gibson Acoustic shop in Bozeman, Montana. 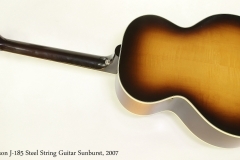 This example dates to June 8, 2007 in Bozeman, Montana, at that point under the direction of master luthier Ren Ferguson. It features the traditional J-185 construction, using a Sitka Spruce top, figured Maple back, sides and Mahogany neck, with rosewood for the bridge and bound fingerboard. The headstock logos and split-parallelogram position markers and the two bridge dots (which cover locating bolts) are Mother of Pearl. Tuners are nickel-plated Grover Roto-Matics and as a modern Gibson acoustic, it’s factory equipped with an L R Baggs pickup system, controls mounted discreetly in the soundhole. It’s in overall good condition, with some light play wear from expressive strumming on the top, arcing down from the pickguard. There’s a practical reason these guitars have fairly large pickguards! It has recently been in our shop for service and plays very nicely. I like this guitar a lot. For country-blues fingerstyle or rhythm, it delivers and projects a lot of punch and clarity but with warmth and depth. The smaller body size – 16 inches across at the lower bout – makes it more comfortable for me to get around compared to a 17 inch Super Jumbo J-200. “The first Gibson J-185 was introduced in 1951, giving players a broader choice of flat-top acoustic guitars. It quickly became a hit. With a slightly smaller body than Gibson’s fabled Super Jumbos, the J-185 offers an excellent alternative for players seeking a smaller body style without sacrificing acoustic power and projection. I have had this guitar back over a week and I am still ecstatic over what a great job Jay did with that humble Classic Vibe Strat! After you guys put that Lollar CC pickup in the neck of my tele, I couldn’t find a telecaster style bridge pickup which matched up closely enough with it for my taste while still fitting in a conventional telecaster bridge. So Lollar wound three balanced output CC tele neck style pickup and I bought a CV Strat in order to have something to try them out in. It was a total experiment. The CV strat had had its fret edges beveled just a little deep and there was some playing room lost on the fret. I asked the fellow who helped me (Scott? ), if he could put a new nut in with a bit tighter string spacing to compensate for the loss of playing space and he assured me that he could and we left it at that. Now as things turned out Jay was the fellow who ended up working on the guitar. Now in a mediocre place when a different fellow works on your instrument than the fellow you talked to, something usually gets lost in the translation. But I’ll have you know, that thing plays fantastic now. The before and after with a new nut and set up was really striking. Way beyond expectations! I had assumed that I would check out how the pickups sounded and change out the neck to a Warmoth or something, once I determined whether it was worth it or not. This guitar is remaining intact now. I have owned a lot of instruments, have taken guitar building courses and put guitars together myself. 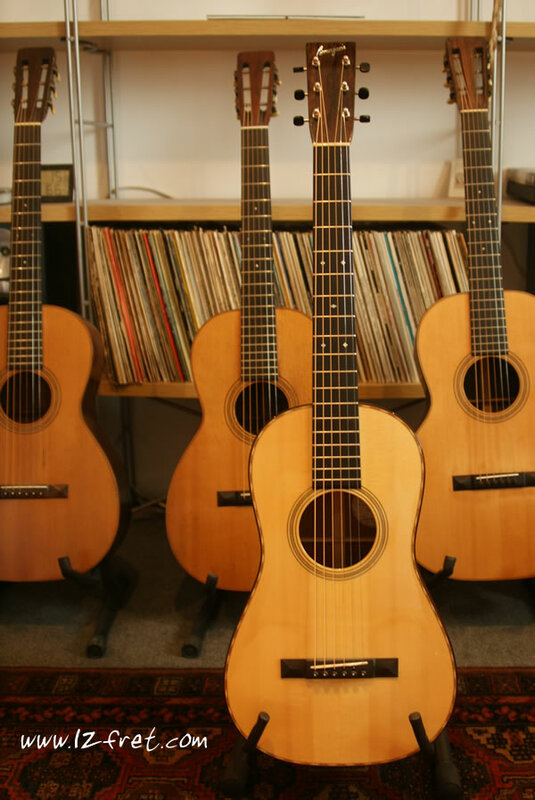 Twelfth Fret’s work really is on a different level than other places in this city and it is not only the technical ability but taking the time to understand clearly what the customer wants and treating even less expensive instrument with care. I couldn’t be happier. This set up has taken this guitar to a different level now. I have a totally unique instrument that can effectively go from playing thick George Benson single-note jazz lines to Dire Straits approved ‘quack’ with the flick of a 5-way switch!